Sri Lankan Americans For Barack Obama: News: "Tamil Doctors Say Only 600 Killed"
News: "Tamil Doctors Say Only 600 Killed"
Four Tamil doctors have been allowed back to work after being detained and accused by Sri Lanka's government of exaggerating civilian casualties. 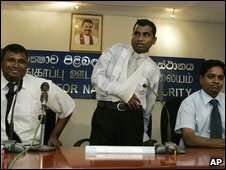 The doctors treated Tamil civilians throughout the final phase of Sri Lanka's bitter war against Tamil Tiger rebels earlier this year. After the government declared victory, the doctors were arrested. They later recanted their claims, saying they came under pressure from the rebels. They were released on bail recently. Three doctors have now been posted to the northern and eastern provinces. Another one has been allowed to pursue higher studies in Colombo. A fifth doctor, Dr Sivabalan, who the government claimed was working for the rebels, was also detained. He has not been released. The doctors still face charges of talking to the media and aiding rebel propaganda. But one of the medics, Dr Satyamoorthi, told the BBC Tamil service of his relief at being appointed as a health director for the northern province. "We are very happy to join back," he said. "We have to appear in the court on 9 November. Apart from that we have to go and sign in at the Criminal Investigation Department's office every month. "I hope in due course we may be discharged from these cases," he said. Regularly during the war some of the doctors said people had died in shelling which appeared to come from government-controlled territory. When recanting their statement Dr V Shanmugarajah said that he and his colleagues believed a total of 600-700 civilians had been killed, and nearly twice that injured, between the start of January and the end of the war. But United Nations figures for those killed are roughly 10 times higher, while on 12 May the Red Cross said it had evacuated nearly 14,000 sick or wounded people and their relatives since mid-February. The Sri Lankan government barred journalists from entering the war zone so there has been no way of verifying the various claims. Most international non-governmental organisations (NGOs) were also asked to leave the area before the final assault began.